I give JJJRH five out of five stars. By the time you've finished JJJRH, you’ll be itching with excitement at the prospect of actually leveraging social media with expert storytelling and brilliantly crafted images, all with the confidence of knowing which social media platform is for what. I do wish Gary Vaynerchuk had given more weight to Google Plus. It may be my own bias but I feel Google+ deserves its own round in the social media marketing ring. Not a big deal though, it's all about timing and G+ was late to the dinner table. Gary Vee is no slouch and we all know him to put in a 110% on everything he does. 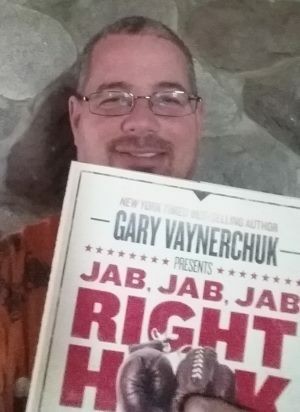 Gary out did even himself with Jab, Jab, Jab by putting in a 150% and writing the social media story telling manual for anyone that want's to make an impact online. Hard Cover: It's a beautiful book too, filled with amazing pictures. And HUGE! See it in my hands above? Actually, I'm holding it a little close to the camera but it is bigger than most of the hardcovers sitting on my bookshelf. Jab, Jab, Jab, Right Hook: How to Tell Your Story in a Noisy Social World takes social media marketing strategies to a level that few can convey. The author, Gary Vaynerchuk, is a social media expert and you will have no doubt about that after reading this book. I have more yellow highlighter entries in Jab, Jab, Jab, Right Hook than any other book I’ve read with the possible exception of my original copy of How to Win Friends and Influence People. Gary uses boxing as an analogy to teach his readership the value of social media and storytelling. I’m far too geeky to care about sports but even I can appreciate the similarities and references he points out throughout the book. You can, in my opinion, translate the term “Jab, Jab, Jab, Right Hook” with “Give, Give, Give, Sell“. JJJRH covers Facebook, Twitter, Pinterest, Instagram and Tumblr in depth and lightly touches LinkedIn, Google+ and Vine in the “Emerging Networks” chapter (Round Eight). The author of Jab, Jab, Jab, Right Hook, as well as others (Crush It! and The Thank You Economy), Gary Vaynerchuk (AKA Gary Vee / Gary V) is a well known New York Times bestselling author, social media expert, entrepreneur, keynote speaker and investor. Gary Vaynerchuk (VAY NER CHUK) has built a multi-million dollar empire around the wine business and shares his business expertise in his books, his videos, and public speaking. Gary is CEO of VaynerMedia and has been featured on The Wall Street Journal, Ellen, Time, Fortune and many, many other magazines, media sites, shows and blogs. At the time of this review, and my reading, About Jab, Jab, Jab, Right Hook was only available in Hardcover. Amazon shows the book to be 224 pages but my copy is 195 pages which includes seven pages of notes. The book is not available on audio at this time but as much as I love audiobooks, I hope this one never makes it to the mic. Jab, Jab, Jab, Right Hook is far too visual a resource for audio to do it justice. Also see my review of Gary Vaynerchuk’s first book of his Business Book Series (Jab, Jab, Jab, Right Hook is the third), Crush It. The book consists of 12 chapters (Called “Rounds” in this book).